Randy Walker gave Northwestern's football program the type of stability the former Big Ten doormat had never enjoyed in its entire history. And he contributed just as much off the football field. Walker died Thursday night of an apparent heart attack at the age of 52. His sudden passing sent shockwaves throughout the college football community. Randy Walker died of an apparent heart attack Thursday night. "This is a devastating loss, not only for our athletic program, but for the entire Northwestern community," Northwestern athletic director Mark Murphy said. "Randy truly embraced Northwestern and its mission and cared deeply for his student-athletes, both on and off the field." Walker posted a career record of 96-81-5 that included a 37-46 mark during his seven-year tenure with the Wildcats. He became the first coach to lead Northwestern to three bowl appearances, including a Sun Bowl berth that closed last year's 7-5 campaign. He was the first Northwestern coach to beat all of the Wildcats' Big Ten opponents during his career. His high-powered offenses regularly averaged 400 yards per game and caused headaches for the Wildcats' more-talented conference foes. Walker's teams were even more successful in the classroom. Northwestern regularly graduated at least 90 percent of his players. "Not only was Randy a great friend to the conference, but to his players, his staff and fans," Big Ten commissioner Jim Delany said in a statement. "Randy accomplished a great deal at every institution he worked for, but most importantly he personified the values of intercollegiate athletics. "He was positive, resilient and honest." On Aug. 31, Northwestern opens its season at Miami University. Oxford, Ohio, is not a normal destination for Big Ten teams, but it was home to Randy Walker. He was from Troy, Ohio, and played at Miami, starring as a fullback on teams that went 32-1-1 while he and current Illinois coach Ron Zook were teammates from 1973-75. He was the head coach at Miami for nine seasons, and still is the school's all-time winningest coach. Walker died late Thursday night of an apparent heart attack. He was 52. Now the two programs that meant the most to him will meet in what surely will be a highly emotional setting. After leading the Sun Bowl appearance, Walker signed a four-year extension through the 2011 season. Instead of using Northwestern as a springboard to anther job opportunity, Walker appeared intent on finishing his career as a Wildcat. 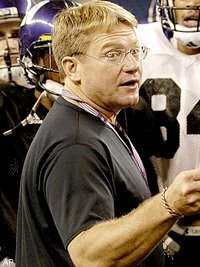 "He coached at Northwestern (as an assistant) in 1988 and 1989 and wanted to come back," said Louis Vaccher, the publisher of WildcatReport.com. "This was where he wanted to be. I think he would have stayed as long as they would have had him." That loyalty extended to his home life. Walker was a family man with a wife, Tammy, and two children in their 20s – Abbey and Jamie. His youngest child, Jamie, graduated from Northwestern in 2004 and works as a recruiting assistant on the football staff. "My thoughts and prayers are with them," Michigan State coach John L. Smith said. "We've lost truly one of the good guys in the coaching profession. I liked being around Randy and talking football. I also enjoyed coaching against him. … He was a great guy, a class guy and he'll be missed." Walker came to Northwestern from Miami (Ohio) University, where he had played fullback in the 1970s. Walker posted a 59-35-5 record in nine seasons at his alma mater, including a 10-1 mark his final year. His 1995 Miami team upset Northwestern to hand the Rose Bowl-bound Wildcats their only regular-season loss of the year. "I am in absolute shock," said Indiana coach Terry Hoeppner, who worked on Walker's staff at Miami before succeeding him as head coach. "I lost a friend and someone I learned a lot from in our time together at Miami. He is a great man, a great family man and a great person. Words cannot express how much I will miss him." It seems every year the Florida State Seminoles lose more players to being kicked off the team than they do for failing grades. That's a sad thing to say but very true. The Seminoles number one kick returner has been given his walking papers by the team. Kenny O'Neal was dismissed for conduct detrimental to the team. This is the third player this year who has been released by coach Bobby Bowden. There seems to be a pattern here and we need to find out where the problem lies as we are losing good kids and most of the time their getting into further trouble which doesn't help either party as the college is always mention if the kid gets in trouble. Many people have asked me what I think the problem is. I think it stems from broken homes where you are putting all the pressure on the mother to raise these kids by themselves. You can't expect them to be mother and father they just can't do that. A father figure is needed for these kids and unless things change we will continue to read about players being kicked out of programs. It's a sad fact of life. The star of the 2005 Big Game and a person for which many Old Blues had high hopes has ruined his college football career. SAN FRANCISCO - California suspended senior quarterback Steve Levy indefinitely on Monday after his arrest on felony assault charges stemming from an alleged bar fight. Levy, who came off the bench to lead the Golden Bears' season-ending victories over Stanford and Brigham Young last season, spent most of Sunday in San Francisco County Jail after his arrest on suspicion of assault with a deadly weapon other than a firearm. According to police, the weapon was a pint glass from Kells Irish Restaurant and Pub in San Francisco's North Beach neighborhood. After a bar employee broke up a dispute between Levy and another patron early Sunday morning, the quarterback picked up the glass and hit the employee in the face, San Francisco police Sgt. Neville Gittens said. The 22-year-old Levy apparently tried to leave the bar after the incident, but was detained by people on the street until police arrived, Gittens said. "We're aware of the situation with Steve, and he will be suspended from all team activities until we have more information," coach Jeff Tedford said. Levy, a longtime backup who played fullback for one season earlier in his career, led the Golden Bears to season-ending wins in the Big Game and the Las Vegas Bowl in his first two career starts. He was expected to compete for the starting job again when Cal's players report to training camp on Aug. 6, though Nate Longshore and Joe Ayoob moved ahead of him on the depth chart after Cal's spring game in April. "We have taken our initial action," athletic director Sandy Barbour said. "Now we're gathering information, and any further action will take place after we feel like we have the complete facts." Levy, a New York native, attended an elite New Jersey prep school before joining the Bears in 2002. Winning isn't everything it's the only thing when it comes to college sports. You may ask why I would say that. Colleges know how much money a winning season means compared to a losing season. Take for example a stadium that holds 50,000 fans at 10.00 a ticket equals 500,000.00 dollars and you add 6 home games your looking at 3 million dollars. Now take a losing season and you only draw 20,000 paying customers at 10.00 would equal 200,000.00 times six games equals 1.2 million dollars. You can see how important winning is. This is just one part of the equation that schools look at. Winning programs sell alot more merchandise than if their losing. Take the Texas Longhorns for example their merchandise sales were in the millions and it helps to pay for the schools other programs. You also have to look at boosters to, as they are more willing to toss dollars at a college that is winning than one is losing. The bottom line is if you win you will turn a profit most of the time. If you lose your school will lose money and raise their prices and force to cut things. Why do you think winning has become so important to colleges. The bottom line is all for the mighty dollar at the expense of the athletes. West Virginia Sleeper This Year? West Virginia shocked alot of people last year with an 11-1 season and many upsets along the way. The biggest was an opening day upset of the Georgia Bulldogs. Were these really upsets or maybe the Mountaineers are really this good. The Mountaineers are a very young and hungry team and should improve this year even more. I do think that it will be alot harder for West Virginia this year as many teams now know they are for real and will prepare that way. many of the freshman stars from last year now have one year under their belt and will be much better. Offensively the Mountaineers have a very powerful team, in fact maybe one of the better in the country. THeir defense is the only thing I worry about. They will need to play well if the Mountaineers hope to play for a National Championship. In the end they should easily win the conference and could be in the hunt for a National Championship. This is one team that I have marked as a sleeper team. Don't be shocked if at the end of they year they are right there playing for all the marbles. After the LSU Tigers destroyed the Miami Hurricans in the Peach Bowl many people wanted heads to roll and they did. Most of the Miami staff was let go my head coach Larry Coker. Miami's problems run deeper than assistant coaches it's the product they put on the field and especially the skilled positions. Miami hasn't had a franchise NFL quarterback in a long time. Miami use to turn them out every year now they just aren't getting the prime time players like they use to. If they do get them they are on the defensive side of the ball and that doesn't help the offense. The defense will be strong again this year for the Hurricanes and the offense will continue to struggle. This is a weird team to get a read on as sometimes they will look like the best college football team and other times they will look no better than a mid-major coleege football team. Will they contend for the title? I don't see that, but they will be in the hunt as there defense is one of the best around. Does The Defending Champions Texas Have A Shot? The Texas Longhorns are the defending National Champions and are looking to repeat and keep the trophy in Austin Texas. The hardest thing the Longhorns will have to adjust to is life after Vince Young. Young saved the Longhorns countless times last year and they don't have another Vince Young in the stables. Now don't get me wrong the Longhorns are still loaded and favored to win the Big 12 championship again this year. They are in the same boat the U.S.C. Trojans are teams are creeping up on them and it won't be as easy as it was in the past. Teams like Oklahoma and Nebraska would like to claim that top spot again in the Big 12. Texas quarterback Colt McCoy looks like the likely favorite to start at quarterback and he could feel alot of pressure to perform early. The Longhorns will have a tough game when Ohio State invades Austin in September. McCoy will have to play a great game, until McCoy can get into a flow a defense that is still very good will have to carry the Longhorns. I see the Longhorns winning another Big 12 Championship but a National Championship isn't in the cards this year. Can U.S.C. Climb The Mountain Again? Today we will take a look at the U.S.C. Trojans and their quest to get back to the National Championship game after the loss in the Rose Bowl to the Texas Longhorns. The Trojans have a lot of holes to fill as the Trojans graduated a lot of great players to the NFL most notably their three best offensive weapons in Matt Leinart, Reggie Bush, and LenDale White. All will be hard to replace as players like that don’t come around all the time. The biggest think the Trojans have to work on in my opinion which killed them in the Championship game was on the defensive side of the ball. During the past year they were able to score enough points so it didn’t matter what the defense did. This year is a whole different story as the offense won’t be able to makeup for the defense weak play. This is the year the defense may have to make a contribution to the Trojan’s success. The last few years all they basically did was watch the offense score points and save games for them. Another thing that Trojan fans should be weary of are the other teams in the conference are getting a lot better. It uses to be a big gap between the Trojans and everyone else. It’s not that way anymore. The Trojans will have a dogfight in the Pac-10 this year as other teams will be right there competing for the Pac-10 title. In some ways this may be a long year for Trojan fans as they have been spoiled by all the success Pete Carroll has brought to the program. An overview on the Trojans is they will still be the best in the Pac-10 but not as dominate as in previous years. It will be interesting to see how well the Trojans do to replace the talent they lost. That will determine how well they do this year. I thought we would get the college football fans right into the college football fray with previews of some of the teams that will be on our radar during the season. Today, we will talk about the Ohio State Buckeyes and what chance they have of hoisting the trophy up in January. The Ohio State Buckeyes almost lost everybody on the defensive side of the ball include A.J. Hawk and Bobby Carpenter both were NFL draft picks and will be playing on Sundays. The Buckeyes must fill the holes left from graduation and it won't be easy. Luckily for the Buckeyes the reserves seen a lot of time so the defense will start out slow but by the end of the season they should be okay. Offense will be king at Ohio State this year as quarterback Troy Smith will be back to lead a offense that should consistently put up a lot of points. Smith will rely on super wide out Ted Ginn Jr and Super freshman Chris Wells to carry the load on the offensive side of the ball. The Buckeyes will score and score often and the only roadblock I really see in the way is a trip to Austin Texas to play the Longhorns the second game of the season. If the Buckeyes get past the Longhorns all the tough games are at home this year for Ohio State including the big showdown against Michigan. I look for the Buckeyes to contend for the National Championship this year. The only question will be can the defense get up to speed fast enough and help the offense out when needed. Welcome to the college football blog where we will be your one stop for everything good and bad in college football. My name is Kenneth Watkins and I will be writing for this blog and I welcome all comments good and bad as I want to hear from college football fans. Let’s start out by taking a look back at the past college football season which saw Texas dethroning USC as the National Champion in a thrilling bowl game. I will admit I was shocked at how well Vince Young play and you have to give him credit for bringing the Longhorns back. For me college football is more than just about the number one and number two teams as many good stories always come out of college football. Charlie Weiss turned around a Notre Dame football program that has struggled in recent years and made them a team to reckon within the future. Probably out of all the teams I was most impressed with being the West Virginia Mountaineers’ football team and how they performed last year. They are a team to watch this year. They won’t be able to sneak up on anyone like they did last year. Many interesting questions will also be answered this coming August about certain programs. Will Miami, Oklahoma, and Nebraska claw their way back to the top or will they all just be meat for their conference foes? Can Ohio State make a run at another championship this year? How about those mid-major conferences will they finally get the respect they deserve or will the BCS snub them again. We will answer all them and more in the college football blog. Another thing we will also be incorporating into the blog is a look at the business side of college football. If anyone thinks, it’s not big business they’re crazy. We hope you will stop back often and post your comments and tell us when were doing good and when were not.